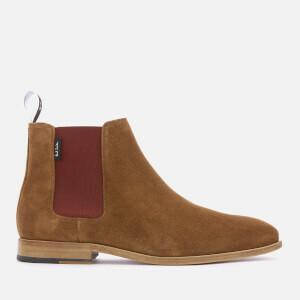 Tan suede ‘Gerald’ Chelsea boots from PS by Paul Smith. 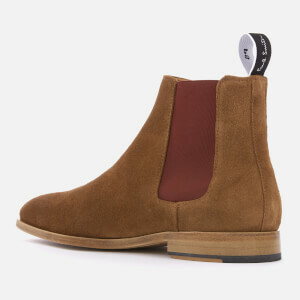 Crafted from smooth suede, the Chelsea boots feature contrasting, burgundy elasticated side gores and grosgrain heel loops with signature logo embroidery. 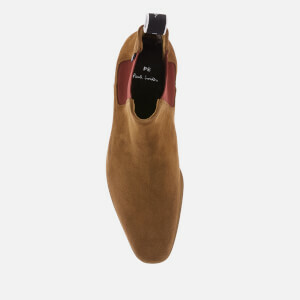 Set on a leather sole with a small heel, the outsole features ‘Gentlemen’s Corner’ notches on each heel and rubber heel inserts for added grip. 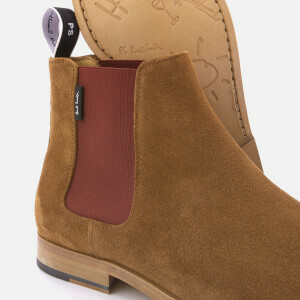 Complete with smooth leather linings and slightly cushioned footbeds with a foil embossed logo.